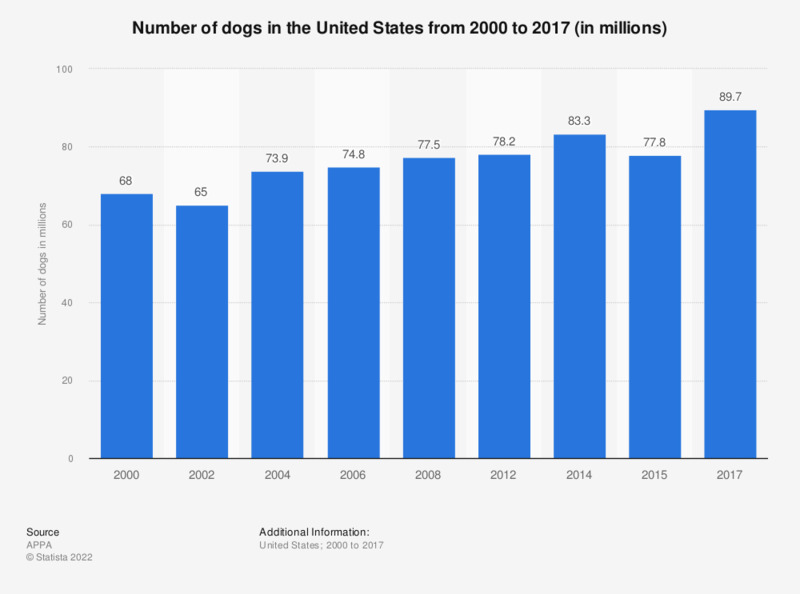 The statistic depicts the number of dogs in the United States from 2000 to 2017. In 2017, a total of about 89.7 million dogs lived in households in the United States as pets. In comparison, some 68 million dogs were owned in the United States in 2000. The domestic dog originated from the grey wolf and still shares their distinctive characteristics such as excellent hearing and a keen sense of smell. As carnivores, they consume meat-based foods. They wear a coat, which can be short or long. Most dogs shed their fur twice a year - known as winter coat and summer coat for adjusting to different temperatures. In other English-speaking countries, the shedding of dogs is called ‘moulting’. There exist a large variety of different dog breeds around the world developed through selective breeding. The most popular dog breeds in the United States include Labrador Retrievers, German Shepherd Dogs and Golden Retrievers. All of them vary in shape, size, color, appearance and typical behavior. Most humans keep dogs as pets in their household and consider them as their long-life companion or even their best friend. Keeping dogs as a pet is quite money-consuming: major costs that might occur comprise of pet food, vet visits, and kennel boarding. Some pet owners like to spoil their dogs by spending additional money on grooming, toys and food treats. In 2017, a total of about 89.7 million dogs were registered as pets in households in the United States. As they are considered as a very intelligent species, dogs can be trained to modify their behavior in order to respond to commands of their dog master. Further training may be used to let dogs fulfill specific roles such as law enforcement, hunting or assistance of people with disabilities. Data prior 2017 have been taken from previous press releases of the same source. The source does not mention the exact publication date. The date given is the date of access.